1) You know how, when you keep hearing about a beer on social media but you can’t find it, you begin to develop a quiet obsession about it? Well, that was me and Rodenbach. Plenty of people in my Twitter feed seemed to be drinking this beer I’d never heard of and saying it was great. So I wanted to try it. But it wasn’t a total obsession – it wasn’t like I went online and ordered some straight away. Nope, I rather preferred the idea of stumbling across it in a bottle shop one day, a surprised ‘‘oh, there you are’’ look on my face. For the same reason, I didn’t actually google the beer to see what style it was. I wanted that to be a surprise. 2) I finally got to try it last year courtesy of Luke and Dave at Ale of a Time. I recorded a podcast with them one hungover Saturday morning during Good Beer Week. And to this day I haven’t listened to that episode in its entirety – listened to all the other Ale of a Time podcasts, but not that one. That’s partially because I’m underwhelmed by the monotone that is my own voice. And partially because I think I totally stunk up the room. Pretty sure I was responsible for the worst Ale of a Time podcast ever. If you must listen, fast-forward whenever the idiot with the monotone is talking and just pay attention to the other two guys instead. 3) One thing I did like about that Rodenbach was that it went down so very well with a hangover. That surprised me a lot because I had actually been thinking of piking out of the podcast recording because I was feeling so seedy (I’m a total sook when hungover). I certainly wasn’t looking forward to drinking any beer, but I soldiered on because Luke and Dave had brought the beers and it would have been rude to refuse. And damned if it didn’t make my hangover more manageable. I think I may have referred to it on the podcast as akin to Berocca. Sure, there may have been an element of ‘‘hair of the dog’’ going on. But it really felt like a bit more than that as well. It genuinely freshened me up. 4) Even when I have it and I’m not hungover it’s still refreshing. In fact, I’d go so far as to say this is the most refreshing beer I’ve ever had. Even when I don’t think I need to be refreshed, it still refreshes me. 5) While I’m a big fan of beer in cans, it strikes me as not-quite-right that a (partially) oak-aged beer ends up in cans. Yes, the non oak-aged part is fermented in big steel tanks, which are kind of like cans. But still, it feels a smidge weird to me. Like it’s a little bit fancy to be in cans. Maybe there’s still a vestige of the ‘‘canned beer is bad’’ philosophy stuck somewhere in my head, because I know cans actually keep beer better than bottles. But it’s a feeling I haven’t been able to shake. 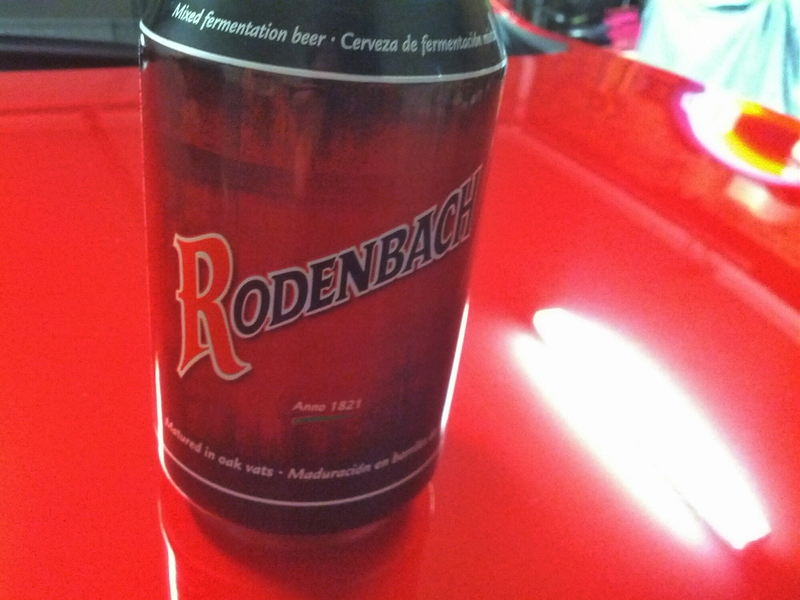 I’ll still drink canned Rodenbach, though. After getting into beery podcasts recently the ale of a time being one that I have listened to (or in Luke’s words, suffered through), upon the recommendation but against my aussie only policy thought it best that I try a Rodenbach. Also picked up a bottle of Grande Cru, which fell out of the fridge, got another. Have to agree with you, Rodenbach, refreshing, sour but inoffensive, a subtle intro to sours. The Grande Cru takes up another level. Have yet to have the opportunity to try it as a hangover cure although with the head cold I currently have the effect could be similar. Don’t actually recall the underwhelming monotone voice, you would not be alone in the world of podcast guests or for that matter the presenters in that regard. I am sure that anyone listening is more interested in the person behind the voice and their take on things rather than the voice itself. Never been comfortable listening to my own voice. Thanks for the kind words. The Ale of a Time podcast is very good, on par with the NZ Beer Diary podcast. And that’s very high praise indeed.